Thanks to Marco, our brilliant webmaster, I am now in possession of numerous files that have every single newsletter I wrote starting in May 2002. What a lot of memories! Pity in only one way – I had completely forgotten some names and events – a reminder that age is marching on relentlessly !!! 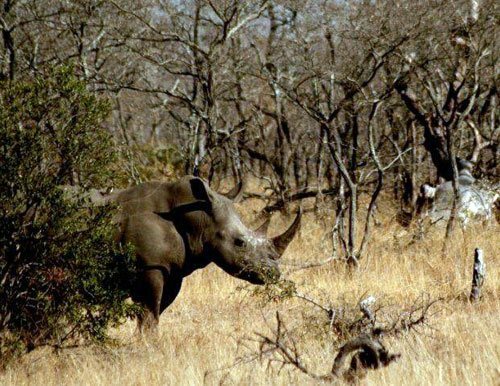 It is noteworthy that both the rhino and buffalo sightings in Kruger Park proper have dropped. 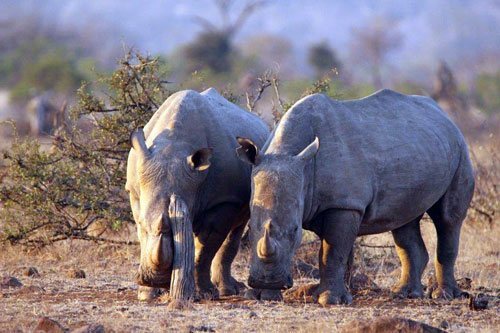 We know that poaching has played a devastating role in the demise of the rhino and that the last few years’ crippling drought had an effect on the buffalo population. At Viva Safaris we are fortunate in that our guests have alternative game viewing possibilities in other game reserves besides Kruger Park proper. In Balule, game viewing has recently been rather hit and miss. The sightings of buffalo have been poor as a result of sparse grass availability. Ditto for White Rhino. Most of our rhino sightings in Balule (over 90 %) have been of Black Rhino. Success rate has been about 50%. At Tshukudu our sightings of Buffalo have been 75% and White Rhino 80% respectively while at Motlala these figures are Buffalo 100% and Rhino (either White or Black) 80%. Therefore there is merit in our guests (who have the time) extending the length of their safari experience to 5 or 6 days. When one considers that this includes board and lodging as well as game viewing activities, it is extraordinary value. With the rand/dollar, rand/euro and rand/pound rates all slipping, it is actually a bloody steal !!!! Perhaps this goes part of the way in explaining why Viva Safaris is doing so well – our August 2018 figures were over 10% up on August 2017. 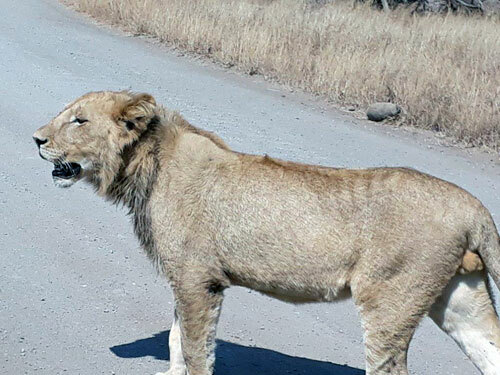 3rd August : Windy – difficult to find game, 6 lions on s100,Elephants at Ximangwanini dam, herds of Buffalos at the same dam, white rhino before Tamboti camp and general game on h 7 road and a brilliant sighting of Ostriches crossing the road before the last Orpen boom gate. 9th : The day was hot, Orpen waterhole lots of elephants drinking and 4 dagga boys (male buffalos) waiting for the elephants to finish drinking, leopard on h7 road Timfeneni, lions 4km down s100 road, general game and buffalos on Sweni road and Ximangwanini dam. 13th : Lions at Ngotso dam and Nyamarhi pan, leopard on new road, elephants after Nyamarhi waterhole. 19th : Nsemani dam 2 lions lying down, more lions with a Giraffe kill with cubs, s 40 general game and buffalos, h 7 ostriches crossing the road and 3 white rhino s crossing on s36, elephants at Ximangwanini dam. 23rd : Lions s100 Xibotwana windmill lying down, buffalos just after Xibotwana, elephants s100, leopard on h7 Timfeneni and 3 white rhino before Tamboti camp. 25th : 6 lions s100, cheetahs at Xibotwana windmill, elephants s100, rhinos and buffalos near Orpen. Hyenas trying to drink at Orpen camp waterhole but failed because of buffalos there. 26th : Mating pair of lions at Girivana Waterhole, buffalos s40, elephants Sweni road, buffalos at Ximangwanini dam. On the 12 August at Rome 1 on the way back from the bush walk we found an elephant next to the Landcruiser busy eating. When we tried to approach him, he came towards us. I asked everyone not to move – he kept on coming towards us and when he was about 20m away, I clapped my hands. He then stopped and stretched out his ears, looked at us then he turned around and walked away. My guests loved the experience!!! 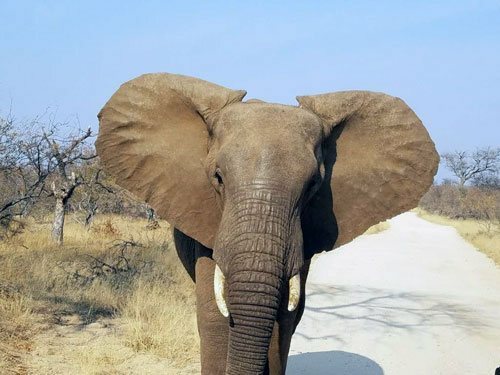 On the 17th at Tremisana lodge we found herd of elephant crossing the road towards the lodge – one of them came close to our vehicle – less than 2m – and smelled us then off he went. On 19th on S100 in Kruger we heard the kudu barking. We stopped, looked around and I saw three lion cubs next to the river. Within 2 minutes their mother crossed the road moving towards them and she stopped and called them. They all came happily running to her. It was great to see this affection. On the 21st at Barnards, west of Shigamba dam we found a male lion lying next to the road. We heard another lion calling in the distance and he responded. We went to Campfire and found the whole pride with cubs coming towards us. It was brilliant having over 20 lions walk right past the open vehicle – my guests could not talk for 5 minutes thereafter – shell-shocked !! Close to Tremisana Lodge we found one lioness walking towards the camp – we followed her – she was not hunting – it looked as if she was looking for her cubs. She walked towards Tremisana dam. 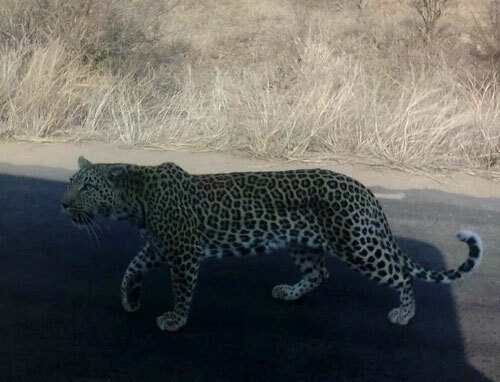 On the 23rd on H1-3 in Kruger two km before S86 we found a female leopard trying to catch a steenbok. Three Km from the junction of S86 we found nine lionesses and two young males lying flat and their bellies were full. On the S125 at Ngenyeni pan we found more than 12 Lions also lying down. This has been an extremely busy month and although sightings have not been booming, the sightings we did get were beautiful and up close experiences. Magical experiences shared with my guests has made this month great – wonderful seeing their smiles and appreciation for nature as a whole. 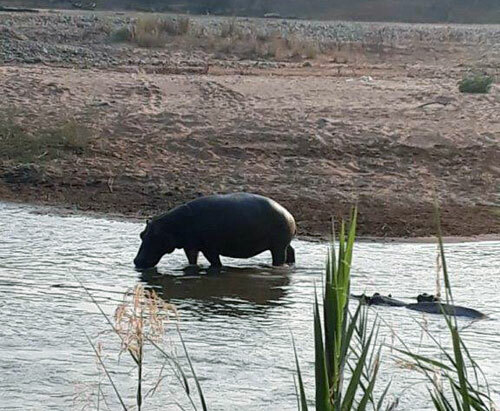 We can always count on seeing our trusty river residents, the Hippos and Crocodiles while conducting our morning walks next to the Olifants River – a river well known for its high populations of hippos and crocodiles. Our guests enjoy this activity as it allows you to get up close and personal with nature. Apart from our usual sightings we also came across a bull elephant while making our way up a hill back towards the vehicles. It is an experience that will remain unforgettable. Elephant seen on Bush Walk. Good sightings of elephant as well as lion. We also have found much general game such as impala, kudu, waterbuck, giraffe and zebra. All in all a great way to wake up. Afternoon drives have been unpredictable with the weather as it has been extremely dry and windy but we have had days where nature has given us the ultimate sightings of Rhino and Elephant. I enjoy these drives as it shows me how the time of day and conditions will determine how the drive will go. After every drive I leave my guests with a smile on their faces and a deeper sense of nature. These drives are my favourites as I get to spend time with my guests as well as spend time in the bush from the afternoon to the evening enhancing our chances of getting sightings and just experiencing nature while appreciating an absolutely breathtaking sunset with some snacks and drinks listening to the sounds of the bushveld. On these drives we have had sightings of Lion, Buffalo, Rhino, Elephant and other general game. Sightings of Lions and Buffalo at the dining area at Marula Boma and listening to Elephant breaking branches as well as all the beautiful calls of leopard; hyena and lion while sitting under a Marula tree where we have Bush BBQ Dinner under the stars – Blows me away! Sunset drives are a great way to welcome our guests to the African Bushveld and the excitement on their faces makes it all the better when being able to show them nature and the animals that most have not experienced yet. It has generally been a cold and windy month and it was sometimes a challenge to view the animals. We went out on our bush walk on a quiet morning, and then we saw a black rhino coming towards us while I was teaching my guest about the beauty of nature. My guests were very scared because I had just recently briefed them about crazy black rhinos. I told them to stand still and the rhino stopped then they started to take pictures and the rhino left us in peace not in pieces !!!! It was a good morning, because I ended up showing them the hippos and surprisingly, despite the early morning cold, we saw a big crocodile lying on the river bank – my guests were very happy !! 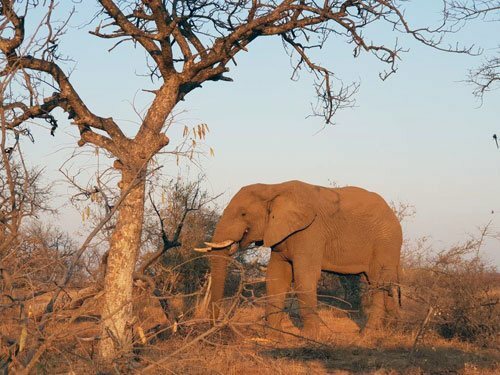 I went out on a sunset drive taking Marula road and we saw impalas, zebra and giraffes and then I took Sable road and we saw elephants – that was amazing because it was getting dark. We reached Marula Tree Boma and we saw a hyena walking around place. They smell the meat that’s being barbequed. We had a great evening. My one sundowner drive was quiet – we saw impalas and kudu. I drove around Rome 1 and we only saw one giraffe and then we had our drinks at Barnards. Lucky we got to see the sun going down. That was cool. Just before we reached Tremisana lodge we saw elephants right at the gate. I was like wow that was amazing because we have been looking everywhere for them but nature will always surprise you. My guests were very happy to see them – even I was excited. Elephant right at Tremisana Lodge. Good day to everyone reading out there…hope everybody is well. It’s that time of the month when we share news and interesting happenings around the bush….the Bush is in dry season and water is minimal – predators are hanging around the main water sources and animals are waiting for rains…its dry and hot but yet sightings still stay amazing. Entering Orpen Gate a couple of Kilometres a big Breeding herd of African elephants spotted about 600m off. H7 general game was plentiful during the entire day. Weather was cold and misty morning, but later open clear skies. Zebra, Kudu male and females, Warthog, Blue Wildebeest and Giraffe all just outside Orpen gate..A flock of Guineafowl was also nice to introduce as there were about 100 all in one spot. I spotted two Kori Bustards feeding (one of the heaviest flying birds in the world). At Nsemani dam huge herds of general game drinking water and crocodile out busy sunbathing as they are reptiles relying on external factors like sun to heat body temperature. After lunch we drove on the S100 and found a whole pride of lions. Spent like 40min with them watching as the cubs played and ran around. On the return drive we were mock charged by a small male baby elephant – very funny – and had mother call him off ! Towards Orpen we found Buffalo in the Timbavati River. Found an impala carcass up a tree and waited almost 40 min hoping to see the leopard come out but luck was just not there…going on more giraffes, baboons, waterbuck and rhino which made the day. White Rhino sighting to end a brilliant day. I especially want to write about this day not just because of the amazing animals we saw…but it was also a very emotional day…Today when we came into Kruger we got news of a poached White Rhino and it had been shot the previous day and been found today in the morning—Kruger National park was doing everything they could. One poacher got shot by the park or so that’s how the story goes…it’s been REALLY tough to view such an majestic animal dead as numbers are dropping….it’s not every day that you see it…so that why I write to create awareness in everybody out there how bad it is …we can congratulate the Anti-poaching team for doing their best in a huge area like Kruger Park. It was not a pretty sight seeing a horn cut and ears as well: (But Safari has to go on. All the sightings during the day were good visual and Quality :). Starting at H7 general game plentiful during the day and first on the list Impala everybody loves them followed by Plains zebra and a troop of Baboons close to Orpen. Going on down H7 finding up next a small breeding herd of African Elephant. I was guiding with Charl this day and we both made space and let them cross nicely over the road between us…we call this (Bush-Traffic) animals blocking the road good 5/5 visibility. Going on down the Timbavati river finding Nyala, Vultures, Giraffe, a big breeding herd of Elephants in the river all doing their own thing mothers and babies all together, Zebra was also very popular around here as there was a water source attraction….AND guess who was inside the water patch? ?..Nile Crocodile yes!! – making an attempt to catch Impala but they were too quick on the legs for the Croc. Continuing on down South towards Mzanzeni as we got an update – just past Mzanzeni picnic sight we found a big breeding herd of Elephants at the dam drinking water and a huge herd of Buffalo lying down including a few Dagga boys. On the S100 we found a beautiful Pride of Lion sleeping next to our open vehicle. Wow what a photographic cat this is. We have had a fair month : Hippo and crocodile by the river with loads of kudu and elephant. Have seen a female black rhino with her calf regularly. Zebra and giraffe are common. A herd of buffalo has frequented the area around Masodini. A female leopard has also been seen often at Campfire property. Hippo pod in Olifants River seen on bush walk. 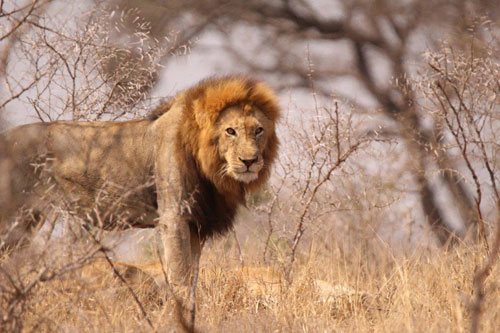 Lions have been seen on the Barnard property and a herd of buffalo at Impalabos West. A bull white rhino is seen near Marula Boma on a few occasions. One of my Kruger days stands out – we managed to find all the Big 5 herbivores before 10:30 am – what an amazing start to the morning – with elephants and buffaloes before the Orpen reception and 2 white rhino relaxing out in the open plains close to Tamboti. We then headed for lunch at Satara where we always get updates. All the guests wanted to see lions. We heard of some lions on the S86 so we headed off. On our way we came across a few cars parked on the side of the road looking at something but we were not too sure what they were looking at. I decided to come from a different angle to the sighing in the hope to view what was going on. As I did so, a leopard ran out of the bush and started chasing a steenbok that I had spooked out the bush by mistake of course and only just missing the kill. We ended off the day with the big 5 and two different lion sightings. Motlala drives have also been something to look forward to at the moment with some very good sightings. This month I have been lucky enough to see leopards 8 times! One evening, we managed to find 5 rhino : 4 black and 1 white, lots and lots of buffaloes, and the elusive leopard busy posing for us on a termite mound right at the end of game drive. Wow !!! Walking with Raymond as we were coming down our first hill I spotted what I thought was a rhino about 500 metres away from us on the next hill. It turned out that this was a hippo – all of a sudden the speculation started as to find out if this hippo was alive or not. Raymond and I decided to approach as safely as possible, making sure we would give that hippo enough space to get away from us if needs be. It was so amazing when we came closer to first realize that this hippo was very much alive. Raymond started thinking he must have been kicked out of the pod where he normally stays, we were already in day time, the weather was overcast which is ideal for the hippo’s sensitive skin. While we were on our way to the hippo, we looked back because we kept on hearing noises, and we managed to see 2 male elephants at a distance. As we turned our heads, we discovered a male giraffe sneaking up on us. Once we came close to the hippo, he was lying down peacefully then he stood up and moved away from us. We decided to let him be and find ourselves a new route to go down to the river. Once at the river we realised than a male and female hippo were busy mating which explained why that bull hippo was alone outside the water at that time of day. Walking with Raymond again on another morning, we had such a nice and quiet bushwalk, very relaxing, on our way back to the cars we heard branches cracking and a hell of a commotion. We stood, Raymond our guests and I, viewing all the elephants that were going to the river. It was magical. We must have been about 50 metres away from them, and they couldn’t have cared less. I took my 2 lovely guests on a long morning drive that one day. We do this when we have guests that are unable to do the bush walk. It was so nice as we had heard lions roaring while preparing tea and coffee for our guests at the Lapa. As I headed out towards Campfire property, we were casually talking about lions in my car when all of a sudden we spotted a huge pride right next to the road. There were 2 males, 4 females along with their cubs, all and all they were about 15 of them. What was even more special is the fact that we were so close and the only open vehicle on the sighting and so we watched them as the sunlight came up. It was just perfect. Going out on a sundowner drive, we decided to stop for our drinks by the river, and what a lucky day – there were some a male elephants. We were sitting on the rocks watching the lights colouration changing. We watched the elephant going away and a short while later 2 new males showed up. These ones were more playful – starting spraying themselves with mud, going to play inside the river. All of a sudden, they decided to cross to come to our side. We quickly packed up and headed back to the open vehicle. Our biggest surprise was that one bull elephant had sneaked on us and was standing about 40 metres away ! I decided to drive on Rome 1. It was quiet but we managed to find a breeding herd of elephants. It was so nice because they were just all around the vehicle. Later on, we found a big herd of buffalos – what a splendid evening – some of them were crossing right in front of us. Between the two ORPEN boom gates general were a lot of animals including zebra crossing in front of our open vehicle. We continued on H7 and spotted a big male Giraffe which was busy walking towards the road. My guests were jumping up and down from excitement when they saw how tall and big this male Giraffe is. We went down S36 to Shimangwanini dam where we saw two male lions lying down under a tree next to the dam. Many elephants were busy drinking water. There were many giraffes also busy drinking and one male buffalo busy feeding. We then took the S100 to Xibotwana water hole where we saw two big male lions lying down right next to us. After lunch at Satara, we took the H7 to Nsemani Dam where we saw many elephants crossing the road to the dam and my guests were very happy. We found three white rhinos (I prefer not to tell location in case a poacher reads this). The Lodge has been busy. We have upgraded some chalets and have installed safes in all rooms. 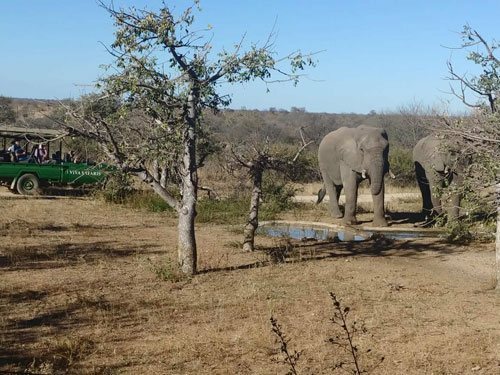 Game viewing has improved – now that the dams at Barnards and Campfire are dry, more animals are coming to drink at Tremisana Dam, which is reasonably full. A lot of animals are drinking from the waterhole in front of the Lapa. Guests looking at Elephant dinking from waterhole in front of Lapa. The warthogs are seen every day eating our grass as there is no decent grass outside the camp. 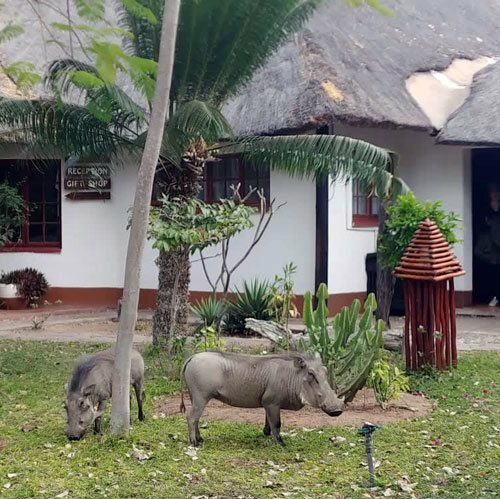 Warthogs eating green grass at Tremisana Lodge. The buffalo herd is moving around in search of pasture and is seen regularly. Some nyala had their young this month. We hear lions, leopards and hyenas just about every night. The toilet and shower at the tents that were served by one door have been split into two units each with its own access. 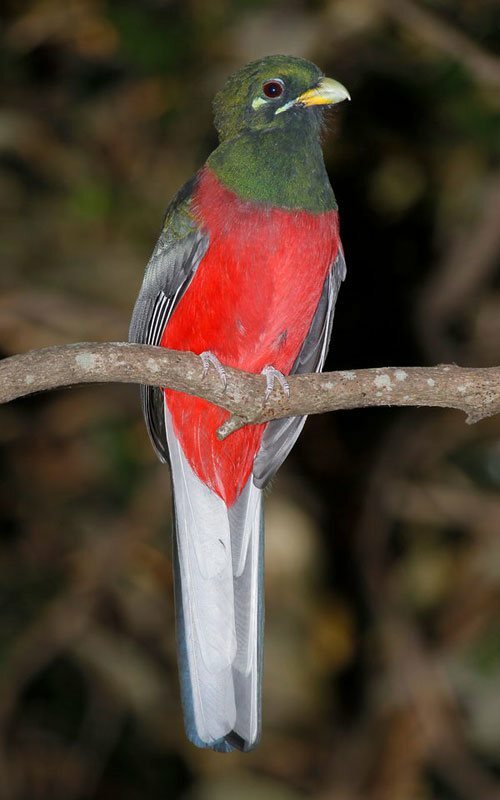 We saw a Narina Trogon in the trees near Treehouse 8 – really beautiful and extremely rare bird species ! 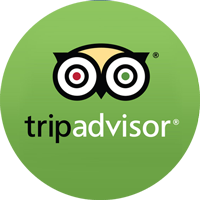 We have been quite busy – Margrett reports that all guests are really impressed when they see the accommodation. She says we have misnamed the Lodge – Katekani Tented Lodge allows the guests to expect a full tent which is not the case – over 60% of the unit is brick and mortar! A HUGE ‘thank you’ to all who have supported us – as mentioned elsewhere in this newsletter, we had more than a 10% increase in guest arrivals compared to last year’s August. This is especially pleasing as we have reports from other lodges and tour operators that business is tough. We attribute this success to the fact that Viva Safaris offers unpretentious, basic value-for-money accommodation coupled with exceptional game viewing opportunities. When all is said and done, the tourist goes back home and remembers the game viewing experience more than anything else on the safari. Our guides are to be commended for their enthusiastic hard work. Where do I start with our praises for the Katekani Tented Lodge? It must be with Viva Safaris who this facility belongs to. Well done for creating such an excellent camp that has been so carefully designed and crafted so every lodge has a warm and natural feel to it that is so in tune with the surroundings. A note to Viva Safaris, your website photos do not do yourself justice, enough, these rooms are simply stunning. With only four, dual tented lodges nicely spread over the camp, you have the relaxing solitude that you seek in the bush. This is only broken by the magnificent roar of the male lions as darkness sets in the neighbouring game reserve. Their fences come with 10 metres of the lodges and it’s a sound that stays with you forever. I need to readily come onto our hosts at Katekani. Henry and Margaret with the help of Nomsa and Nomvula. Now that is a team of wonderful, generous and friendly people that go mile after mile to ensure you have everything you want and you are happy. Period. Henry will take your breakfast order the night before (eggs any way you want) and it will be there on the table for you promptly at 8am. Evening meals were always tailored to your liking. Being from the UK, Henry prepared some wonderful roast dinners, a cracking curry and fish and chips. Perfectly presented by Margaret with a different table thyme each night. Our last supper was outside over a wood-burning Fire. Bliss and when Henry and his team gave us a traditional send off with songs and dance, a few tears were shed. I hope I have drawn your attention to this camp. Come and have a shot. You won’t be disappointed. Once again thanks to Viva and your hardworking and friendly rangers that drove us around the reserves. Charl (a true POWER Ranger, top man and knew his stuff). Andy and Rex who did the bush walks (so many things you can do with animal poo!) and Nico and Patrick for the Kruger drives. Thank you all. Final word. You can go luxury private game reserving and pay a king’s ransom (from experience) or go to Katekani who say they are “luxury budget” and get so much more for a reasonable price. Keep it up and hope to return one day. We’ve just been to Katekani for our 6-days Viva Safari experience and it’s been simply great! The lodge is beautifully located and is perfectly integrated in its incredible natural context. The rooms are extremely comfortable, with a nice pool right outside the entrance and a huge shower, both indoor and outdoor. Margaret and her staff are kind and careful, food is great as well as typical. We also had the opportunity of spending a few days with Piero (the GM) and his wife and it’s fantastic to see the passion and the dedication they are putting in to make sure that our experience would exceed our expectations. Finally…..listening to the animals during night time is absolutely priceless, it makes you feel part of the bush! Me and my friend did the 4 day sleep out tour and everything was above expectations. This tour is not for the glamping kinda people, but perfect for us. We slept outside all nights watching the stars and listening to the sounds of the bush. During our game drives and bush walks we saw so many animals and learned heaps of interesting facts about them and their surroundings. All guides tried their best to spot all the animals we came for. At Tremisana, the host Pretty made our stay so good! Really sweet staff. During our day in Kruger, Nico, our guide, was so enthusiastic and clearly passionate about the animals and surrounding. I could spent weeks in that place and not get bored. My name is John Jennings, but to my many new friends at Marc’s Camp and Viva Safari it will always be Uncle Johnny or simply Mudala. I have been blessed to be able to travel to many parts of our precious planet, and while the places a often spectacular and memorable, it is the people who remain in my memory the most. However, Marc’s camp and Viva Safari raised the bar; they became my South African Family. Let me begin with the most amazing hostess: IVY. She was constantly going out of her way to make my stay not only comfortable but like a home. There were so many little things she did every day, and she would always end her sentence with “Pleasure.” She made me feel that it truly was her pleasure to help me. Next is Sunrise. Oh my gosh! I am still dreaming about her food especially her amazing soups; I could have lived a year just eating her amazing soup. Not only was her food delicious, but her demeanor was ALWAYS cheery, happy, and helpful. Next is Harrison and Lucky: these two young men were knowledgeable, helpful, and kind; they also made me feel like a brother when, at the end of the day, we watched World Cup Soccer. There skills as drivers was unparalleled; they have skills! Oh! I can’t forget Margaret. When I think of her the word that comes to mind is gracious. She washed my clothes at Katekani, dried them, and folded them so that I thought I had new clothes. I am not up to the most amazing guide on the planet: NICO. I will tell and have told as many as I can about this young man’s skills not only as a guide but as a person. His encyclopedic knowledge of the flora and fauna was amazing. His humor and friendliness made everyone comfortable. I will never forget the time when he dropped everything he was doing and took time to take me to a place where I could see the Southern Cross. His stories about mountain climbing in the Drakensberg mountains were enthralling. What made him special was his ability to make me feel as if I was a member of his intimate circle. Oops. Almost forgot about Andy. He really needs to write a book about his life! Wow! I will buy it. He was our guide on a morning bush walk to the river. His knowledge of the flora and fauna was amazing as well. As a matter of fact, everyone at Marc’s Camp and Viva Safari was better than Google search regarding anything South African. Victor. There is so much to say about this man. I don’t believe there was one moment when he did not have a smile on his face. He was helpful, kind, patient (with everyone), and knowledgeable. He, as well as everyone else, became my friend. I know that he would give me the shirt off his back, and I would not have to ask for it; he would simply give it. He has become, along with Ivy, the face of South Africa, of Marc’s Camp, of Viva Safari. Finally, there is Charl; he is the one who keeps everything running smoothly. As the manager of the facilities, his ability and knowledge was amazing. He knew/knows how to “get things done.” It is his life’s choice to do what he is doing, and it shows. This young man could be doing anything, but he has realized that it is not what you do it is who you do it with. He has chosen Marc’s Camp and Viva Safari; this choice has made all the difference in how smoothly and efficiently EVERYTHING is accomplished at these facilities. I know I have forgotten someone, and I am truly sorry. I tried to keep a note of everyone who helped me, who befriended me, but there were so many I couldn’t keep track of them all! Thank you! Thank you! Thank You! We stayed 3 nights/4 days at Tremisana Lodge. Our room and bed was comfortable, although the bathroom was a bit tight, but we weren’t there for the shower. The food was home cooked and different every evening. The first night was an evening meal in the bush by candlelight which we really enjoyed after our first sunset game ride. The cash bar was easy, we settled the bill upon departure. The staff was very welcoming, and our host Pretty took great care of us. We really enjoyed the programs, especially the bush walk. The guides were all knowledgeable, and each one taught us new things. On our game drives through Balule Private Reserve we saw lions, elephants, giraffes, impalas, hippos, and more. Our day at Kruger also brought an amazing sighting of a mom Leopard and two cubs hanging out in a tree after dining on an impala they had brought up into the branches. We also saw rhinos which was exciting. Overall we loved the stay although we were pretty exhausted by the end!